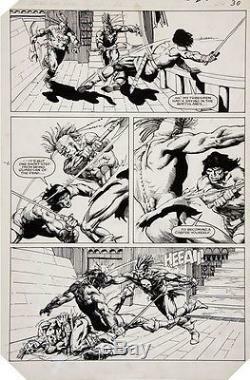 MARC SILVESTRI ORIGINAL COMIC ART CONAN THE KING #20 PAGE 26. SYNOPSIS: It is but one short step from being guardian of the dead to becoming a corpse yourself! This bloody page from "The King is Dead" (Marvel, 1984) has an image area of 10" x 15", and, aside from clipped corners and light soiling, it is in Very Good condition. The item "MARC SILVESTRI ORIGINAL COMIC ART CONAN THE KING #20 PAGE 26 Measure 15 x 10" is in sale since Tuesday, August 15, 2017. This item is in the category "Collectibles\Comics\Original Comic Art\Interior Pages". The seller is "reedcomics" and is located in Bedford. This item can be shipped to North, South, or Latin America, all countries in Europe, all countries in continental Asia, Australia.